Inspecting Soft Story Retrofit Projects | Inspection Services, Inc.
A team from ISI spent the afternoon at the 2016 Earthquake Retrofit Fair in San Francisco on April 19. 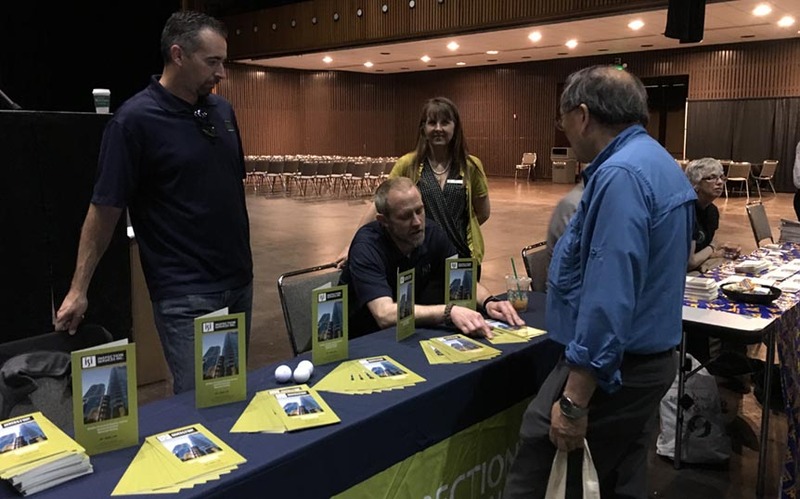 Tobin Gaut and Ed Putman were happy to help property owners understand the inspection process for the Mandatory Soft Story Retrofit Program (MSSP). The program requires property owners to seismically strengthen vulnerable buildings that have an increased risk of danger during an earthquake. These buildings are older, wood-framed, multi-family buildings with a soft-story condition. Many of the people we spoke to were under the impression that the City provides the special inspections. So they could plan ahead and avoid unpleasant surprises, we let these bewildered property owners know that special inspections were likely to be listed on their permits. “Doesn’t the City Inspector do this?” The City Inspector signs off after the special inspector provides a Final Affidavit attesting to the fact that the inspections were done and passed. The building inspector does do some inspections and signs off the final inspection. “How do I know which inspections will be needed?” There will be a list of required inspections on your permit. “What inspections are done by the special inspector?” Some of the most likely inspections in a soft story seismic retrofit might be: proof-loading anchors and dowels; welding, structural bolting, concrete reinforcing steel inspection, concrete inspection for the pour; casting strength cylinders, shear wall nailing, diaphragm nailing, wood moisture, non-destructive testing of steel, and possibly waterproofing. Who pays for these services? Why doesn’t the Contractor pay for the inspections?” As the property owner, you pay the fees for special inspections. We work on your behalf to make sure the contractor provides the specified materials and builds according to the approved engineering plans. You won’t have to worry that the work may not be done correctly or that the materials might not be right. If the contractor paid for our services, it would be a conflict of interest. It’s important that we work for you, on your behalf. “How much might it cost?” Most firms like ISI charge by the hour as needed. Competitive rates are offered. The final fee depends on how many tests are required by your particular retrofit. “Why didn’t someone tell me? Are you sure?” Well, we can’t answer to why this information isn’t provided in further detail, though the City’s overview is very helpful. We have experience with the City’s Department of Inspection and with these kinds of projects so yes, we’re sure. We know this may come as bad news, but we’re glad to let you know now! It’s best to know ahead of time to avoid an unpleasant surprise later in the project. We know how important it is to plan your financing ahead of time.